Twelfth Night is traditionally the last day of the 12 days of Christmas. Nowadays we tend to think the festive season is over as soon as we return to work after the New Year Bank Holiday, but in the past people celebrated Twelfth Night with mummers' plays and parties. 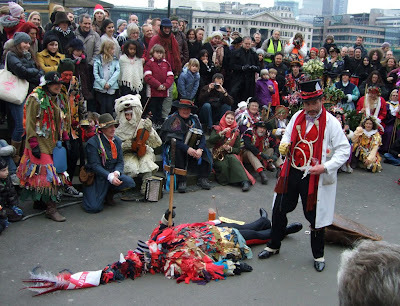 Here are a couple of Twelfth Night events taking place in London. The photograph above shows last year's Mummers Play at the Twelfth Night celebration at Bankside, outside The Globe theatre, in London.